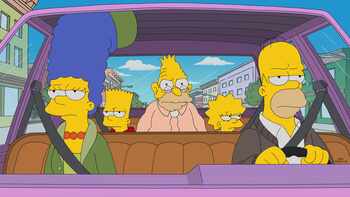 The expressions on their faces are what people have when watching Zombie Simpsons. The title of this episode is annoying. The vast majority of them are insufferable. They’re mostly mangled, cringe-worthy attempts at puns or just outright rip-offs of other titles. When the actual show did it, they were usually entertaining or at least coherent. I think there’s one in particular that grates on me, but I can’t bring myself to type it out. It has “munched” in the title and sounds stupid as hell, and that’s just one example. Oh, and then there are those that try to rip off titles from the classic seasons, which is even more irritating, like “Flaming Moe’s” or “Oh Brother, Where Bart Thou?”, which makes me want to slap someone. just watched it – i haven’t watched ZS in years, and the writing seems to have changed (as have a lot of the voices). While it’s still nothing like the Golden years, it’s actually not terrible. Although they changed the Skinner story again. They’re changing the characters, but they’re trying not to Flanderize them too much. Fans have been saying “It’s getting better!” for decades in hopes that their belief will bring the show back. Give up, it’s over. No, it’s a trap! It’ll be back to being soulless crap within a week! Save yourself and watch the old episodes on DVD or FXNow.